Growing up I had two favourite cakes, Fraisier and Black Forest. For some reason no one makes the Black Forest anymore. Maybe it’s because of the canned cherry filling that most recipes call for. This is me trying to bring the Black Forest back. I made this cake for Father’s Day. I don’t want to brag or anything, but I have the best dad ever. Ever. So I wanted to make him a really beautiful cake. Sadly, the heat and humidity made icing the cake very complicated. It ended up not quite as pretty as I imagined, but still very very tasty. 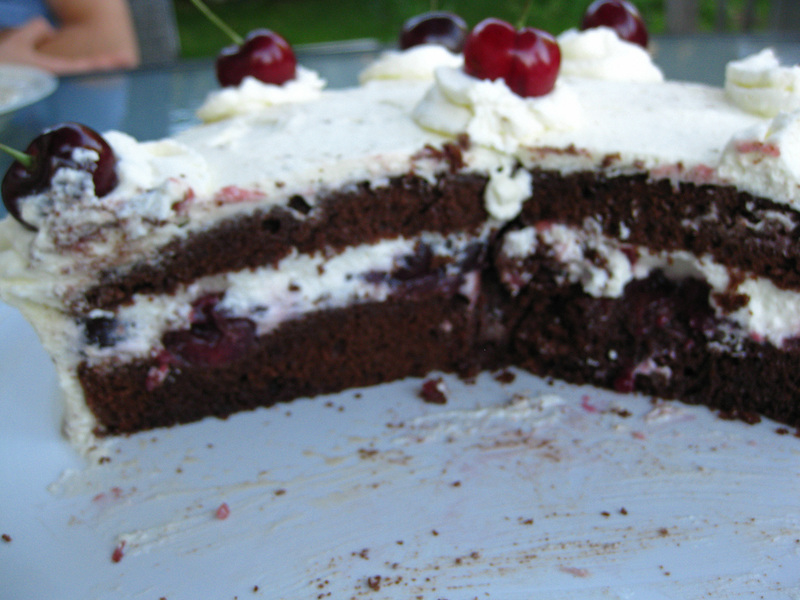 The idea to make Black Forest Cake started with my lack of control when it comes to buying fruit. I had way to many cherries to eat by myself before they went bad, so I decided to try to preserve them. I pitted them, then covered them in sugar and amaretto. I let them sit in the fridge for a couple of days, and discovered they were delicious. I used these for the filling. Pitted cherries, soaked in amaretto, plus the juices. Put all ingredients a medium saucepan, bring to a boil. Simmer until liquid starts to thicken. Cover in plastic wrap and let cool completely. Set aside till ready to assemble the cake. Whip cream till starting to thicken. Add icing sugar, continue whipping till stiff. Set aside till ready to assemble. Let cool and set aside till ready to assemble. 4 tbsp unsalted butter, melted. In a heat proof bowl combine eggs and sugar. Place bowl over pot of simmering water and whisk the egg mixture constantly until it reaches 130 to 140 degrees. Take 2 tablespoons of the whipped eggs and combine with the melted butter. Sift the flour and cocoa together. Fold them into the egg mixture in 2 or 3 additions. Pour into a greased 9 in pan. Once the cake has cooled completely, slice it in half. Using half of the syrup, soak the bottom layer of the cake. Place top layer of cake on. 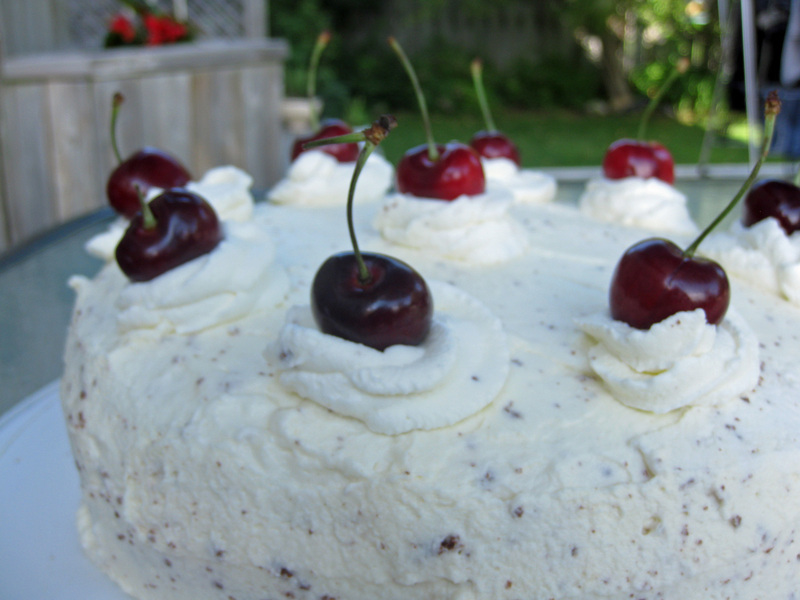 Cover top and sides of cake with remaining whipped cream. Sounds like a wonderful summer cake! I love the cherries on the top, white outside and black isnside. This looks amazing and delicious!! That’s so interesting that you grew up with rice too! This cake looks so good. I love the fact it’s made with fresh, not canned cherries! Cherries and amaretto must be such a great combination! The génoise looks great! Regardless of the heat or humidity, I think this cake turned out gorgeous! I’d love to have a slice. 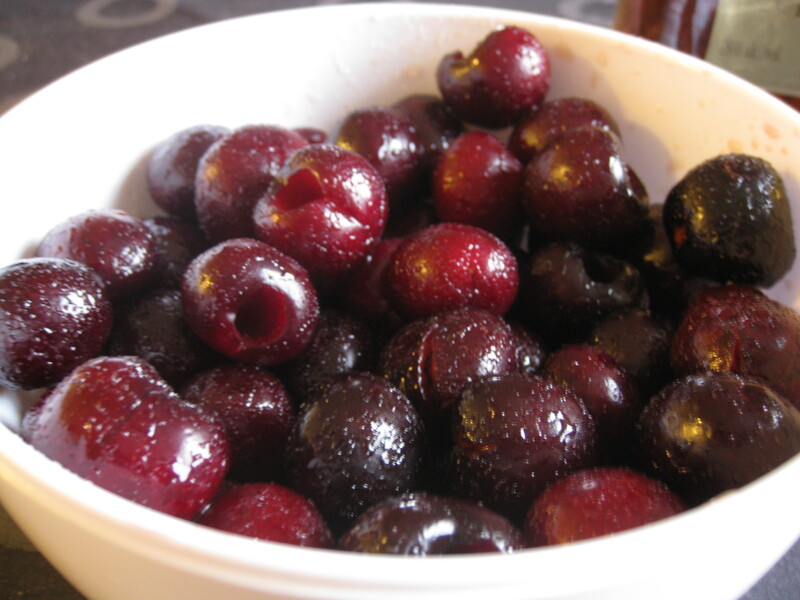 What a great way to use your own preserved cherries. I’m sure your dad really appreciated this cake and it looks really tasty. Wow….this cake looks awesome, so gooey delicious. I made this cake! Looks amazing, I doubled the recipe and made it in four 9 inch pans so I have a 4 layer cake. I also used cherry brandy instead of amaretto. Wish I could post a pic for you…I took several because it’s so pretty! Cherry brandy is a great idea! I’m so glad the cake looks good. Let me know how it tastes!